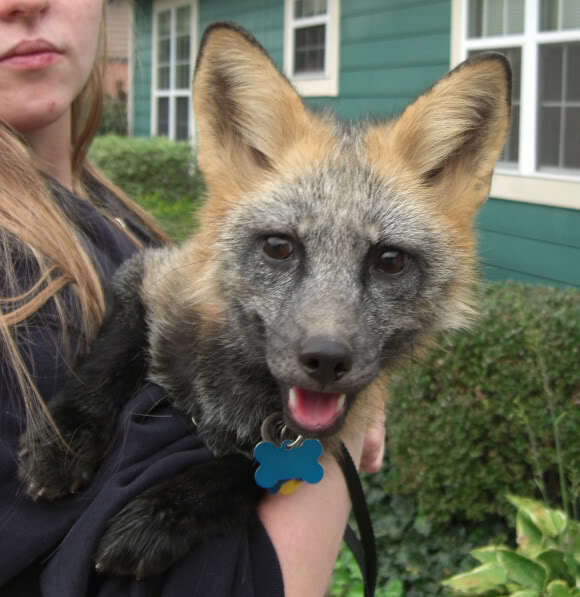 The Pet Fox: Pet Fox Enclosures: Do Invisible Fences Work? Pet Fox Enclosures: Do Invisible Fences Work? I've been asked about invisible fencing a few times by prospective fox-owners, and I wanted to go ahead and make a post explaining my views on them. Many people seem to think that the jolt of an invisible fence is really quite painful--I've even heard an individual say it's like Nazi torture. This isn't even close to being true. Actually, the shock isn't painful at all. My dog uses an invisible fence, and before I put the collar on her, I put it on myself and walked up to the fence on all fours just to see how painful the shock was. It didn't hurt at all--it more startles you than anything else. The purpose of the shock isn't to cause pain. It's to get the dogs attention. An aversive "redirect", if you will. Also, a tone sounds when the dog gets near the fence--it's only if the dog continues to approach too closely that they get the minor jolt. With the proper training, the dog quickly learns to stop going when they hear the tone. Most dogs, once trained, rarely (if ever) get shocked. Invisible fences aren't cruel or painful--so long as they are used properly and you give your dog the correct training instead of just throwing the collar on them and dumping them in the yard. For foxes, however, the situation is a little different. Invisible fences are not, and should not be used as, an effective confinement system for a fox. With dogs, we have thousands of years of experience with training them as a whole, and pretty much have it down to a science which techniques will work most of the time. With any decent invisible fence system, they will include a video showing you step-by-step how to train the dog to respond to it appropriately. One problem I can see is the response to the shock. A dog gets the mild shock, and thinks "Huh? Whazzat? I didn't like that." due to heavy domestication. A fox gets a mild shock and thinks "OH MY GOD SOMETHING JUST HAPPENED AND I DON'T KNOW WHAT IT IS!" Although tame, they've still got quite a bit of wildness left in them, and they instinctively are more likely to respond to something novel with fear. I could very easily see a fox responding to the mild zap with panic and running as far and as hard as they can to get away from the "bad thing". Training them to respond to the fence and the tone would be exceedingly difficult. Not to mention the fact that very clever dogs can figure out ways past the system, and I think that just about any given fox is as smart as a very clever dog. For example, a friend's doberman figured out that if he laid down where he could hear the tone, but not feel the shock, that the collar's battery would wear out and he could escape without being zapped. I'm not suggesting he reasoned this out. I'm certain it was an accidental discovery. Still, once he had figured out that if he laid there long enough, the "Don't Go Any Farther" tone would stop, and he could escape, it was very difficult to break him of it. And if foxes are masters of anything, it's trial and error, so there's no doubt in my mind that a fox could learn this trick very quickly. In summary: Save the invisible fencing for your dog; use actual, physical fencing (buried deep to prevent digging and have some means of preventing scaling the top) for your fox. Honestly, based on some of the stories that you've told about Gizmo, I wouldn't be surprised if he figured out how to build some sort of doomsday weapon out of the collar and the sensors and such. They moved accounts to isuckerpunch on the same site. They claim its their pet. They've stolen quite a few images and claimed they were pets.